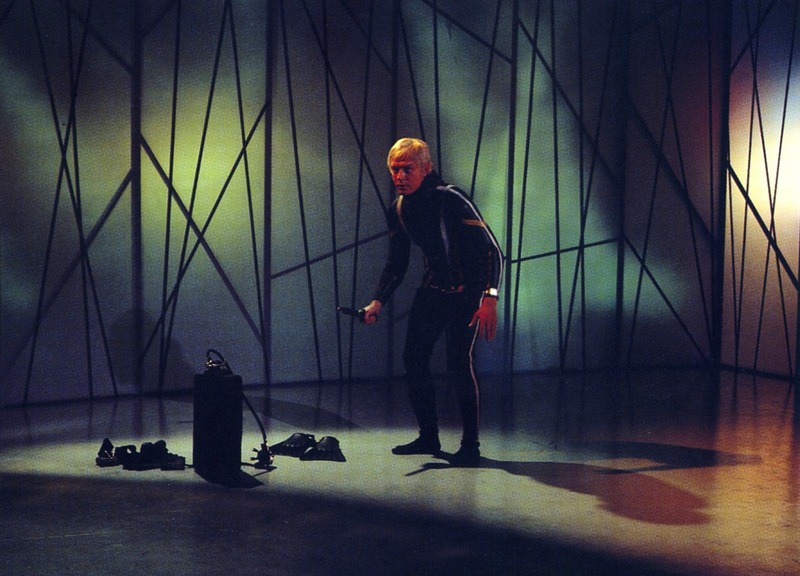 Straker in on the Moon to investigate why an experienced pilot goes on a killing spree on Moonbase- but does the commander bring something dangerous back to Earth with him? "If you don't stop behaving like a goat I'm going to use this cattle prod, matey" "Baaah"
Forget the one big thing you know about zombies because World War Z shakes it up. Out go the shuffling slowcoaches we might expect, instead these undead are stealthy and far harder to avoid which gives the film an urgency other similar ones cannot compete with. There is so little time for people to defend themselves that it creates an urgency that pulls the film way above expectations. 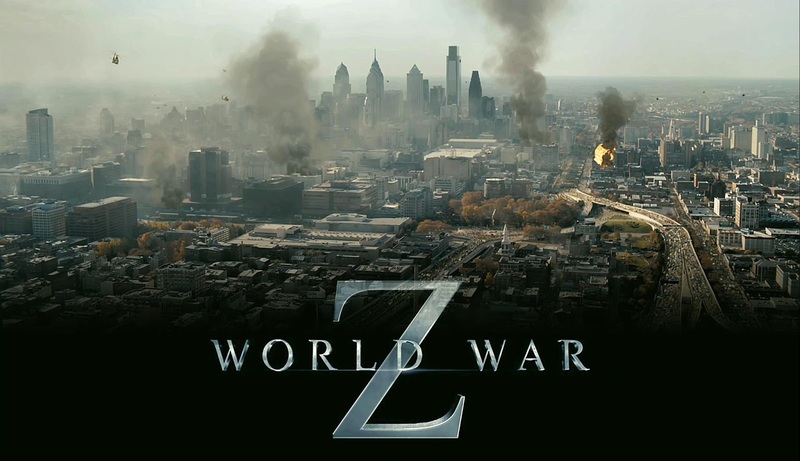 A brilliantly realised opening set up and the movie’s globetrotting also means that World War Z seems far less repetitive than it actually is and the results are edge of the seat absorbing though if you’re looking for characterisation you might not be able to tell the living from the zombies! Chart music: Goldie, Making Up Again . Black Sabbath: Never Say Die . To avoid lawsuits from the parents of crushed teenagers a big gap has been cleared down the middle of the audience. The camera crane lumbers through the gap towards Black Sabbath with the frame tilting from left to right, and then left and right again, as the operator dutches the camera. Meanwhile on stage the drummer has been put at the back and made to wear a shirt, unlike Black Sabbath's last appearance on 25th May. Tonight's audience are more unruly than usual; possibly the camera crane has flustered them? At the front of the stage a bloke in a white jacket pogos and headbangs. He's got something written on the back of his jacket but it's not quite readable... “Eastcote wants home rule”, something like that. Meanwhile, closer to the camera a group of girls have spotted themselves on a monitor and are waving. This coincides with the vision mixer mixing a close up of Ozzy into the shot. The result, it looks as if the girls are waving at the giant floating head of Ozzy. There’s a debate raging at the moment over what to do about `extremist online content` of various persuasions. Depending on people’s situation they argue for or against matters from their perspective yet may themselves be indulging in behaviour that would be considered unacceptable by others or in a face to face situation. The fact that it is very easy to say anything online anonymously and take no responsibility for what happens as a result further muddies the water. Social media makes it very easy to suggest something without proper argument. The reason why many people become outraged and begin their case with the phrase “why can’t the ISPs just…” or “why can’t the government just…” is because they can’t see what they are asking for. If such blanket restrictions as they propose were introduced in everyday life we would call it martial law yet some people demand it online. Straker and Lake find themselves the only people who have not been frozen in a moment of time after a UFO attack. 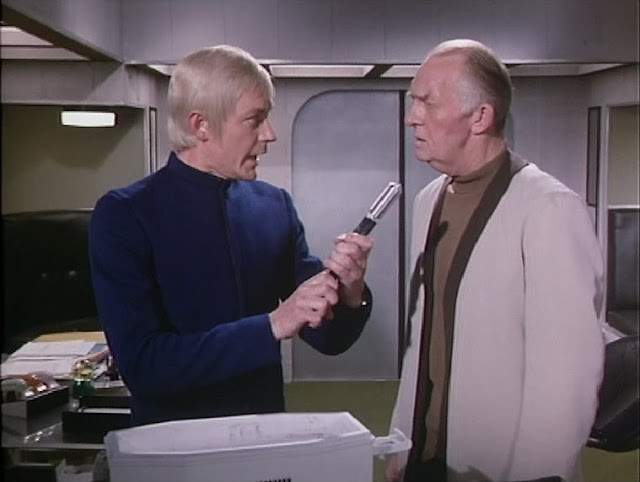 Straker seems to be having a bad day. As everyone goes about their business looking at screens and carrying clipboards, a ragged looking commander starts attacking equipment and fighting security guards. A lengthy chase ensues through the surreal half- finished sets and prop stores of the film studios before he is finally brought to ground declaring “they murdered time.” This remarkable opening sequence is not, as you might imagine, the result of extra strong coffee, but the end of a sequence of events we will subsequently witness. The aliens, you see, are messing with time and that can be a risky business both for the protagonist and also the critical viewer. "Do you think this is a bit too big to use to get the tuck shop to sell me more cake?" The latest Superman is already showing metal fatigue. As the umpteenth skyscraper tilts over, loses its windows and collapses during a climax that appears to last for about a third of the running time of this latest Superman reboot, it was enough already some time back. After a relatively mature and interesting mid-section, Man of Steel cannot resist slipping into the exact same formula as every other big ticket picture of recent years. 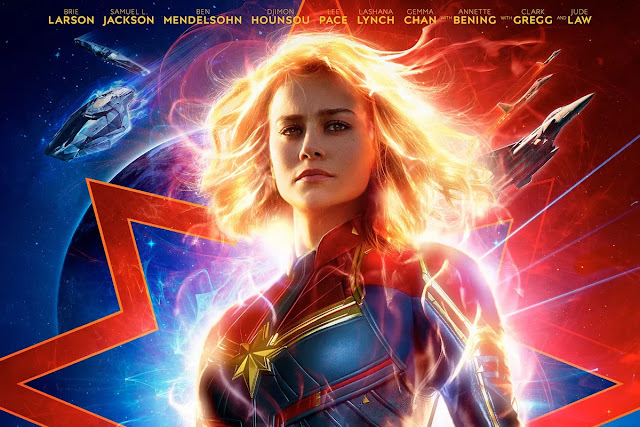 We’d already seen a trailer for two other films that looked exactly the same- lots of buildings exploding, collapsing and people fleeing in panic. You’d think by now people would be used to this. Unlike Iron Man 3 or Avengers Assemble, Zach Snyder’s film does not even seem to have any sense of its own absurdity. He only went out to buy some sprouts from Sainsburys. It’s fair to say there are plenty of maudlin, pessimistic gay themed dramas and lots more that are so shrill and outré any message they might have is lost. Occasionally one surfaces with a bit more class and Beautiful Thing is definitely in that category. 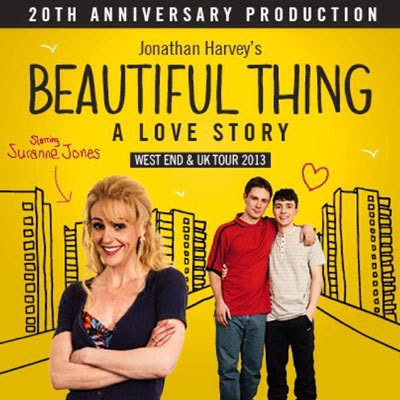 Written by Jonathan Harvey, the play originally opened twenty years ago. This anniversary version debuted at London’s Arts Theatre in April before touring selectively around the UK. Directed by Nikolai Foster and starring the wonderful Suranne Jones, could this play really stand up for itself in a different world. Or is it a different world? The aliens have established an underwater base – but for what purpose? “Probably one of those latest submarines” suggests a fisherman when he spots a UFO underwater. Moments later, he and his boat are in smithereens. The report suggests something like flying fish attacked them. 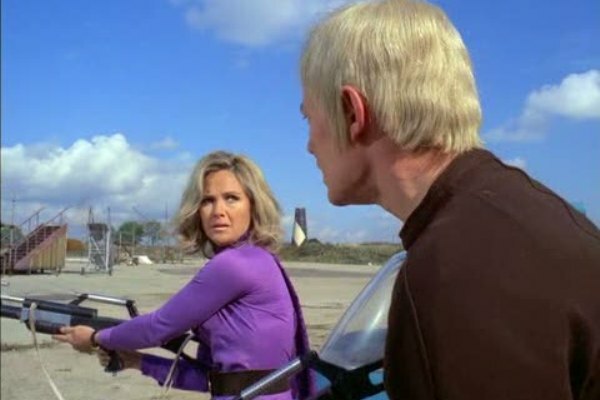 Luckily SHADO is there to attest to the fact that the whole thing is not the terrible result of over inhaling sardines but that the aliens are up to something underwater. Cue lots of scale models and that thing Gerry Anderson always does when trying to get water tanks to mimic the roll of the ocean. If this sounds peculiar then you want to see what’s in the dome the aliens have somehow managed to build underneath a volcano. Clearly, they’ve been watching too many James Bond movies. 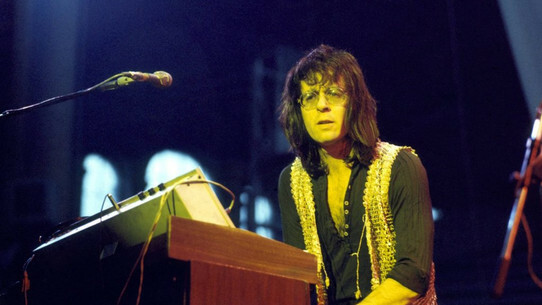 Manfred Mann's Earth Band: Davy’s On The Road Again . A good choice to open the programme. The song is given special attention from the vision mixer. The introduction is tinted sepia before bursting into lifelike PAL colour and later, as the instrumental kicks in, a blue tint moves across the screen from left to right. Then, suddenly, we get an appearance by a mystery woman. “Davy's on the road again... again... again,” she sings. She's not on stage with the band, but she is on video, and forensic examination of the scene reveals she does seem to be in the Top of the Pops studio. Who was she? One of The Ladybirds (who provide vocal backing for the Top of the Pops orchestra)? A wandering minstrel? Rosemary the telephone operator? We'll never know, but surely our lives can never be the same again. Manfred Mann was regretting eating too many bananas. Three people are turned into living bombs by the aliens- with three key SHADO targets in their sights. We’ve become accustomed to the slow canter of most episodes so `The Psychobombs` stands out as it runs crisply through a packed narrative maintaining its velocity from start to finish. While the concept may seem ridiculous both writer Tony Barwick and director Jeremy Summers sell it convincingly courtesy of some bonkers pretend science and lashings of stylish tension. As with most of these later production block episodes there is a determination not to pander too much to the younger audience with the motifs of the early part of the series slowly being pulled away to uncover something inclined towards older viewers. This week they are so anxious to get on with it they don’t even bother with a title sequence. "Ere, Dave do you think we look a bit like Abba?" "What the jiggins happened to Frida? Is she up that tree?" Tony Blackburn, “Hello. Welcome to Top of the Pops and right now here's a run down of the brand new top thirty. Chart music: Yvonne Elliman, If I Can't Have You . The Real Thing: Let's Go Disco [NEW]. As The Real Thing perform the first song of the programme Legs & Co are dancing live on the studio floor. It never quite works because the camera angles tend to favour the band and audience, so Legs & Co get a little bit lost in the frame. Still, more important than that, Floyd's back! For those of you unaware, Floyd was one of the male dancers with Legs & Co's predecessor Ruby Flipper, themselves a replacement for Pan's People. Ruby Flipper never caught on and the all female Legs & Co (the BBC held a competition and got viewers to suggest names) were introduced October 1976; Ruby Flipper had lasted eight months with both Lulu and Patti making the leap from Ruby Flipper to Legs & Co. Floyd used to specialise in pulling stupid faces and wearing ridiculous costumes (both well demonstrated in his performance of Disco Duck by Rick Dees And His Cast Of Idiots), and when Ruby Flipper were given the finger I became concerned for Floyd. I could imagine him sitting at home watching Top of the Pops enviously, and sobbing whenever Legs & Co dressed up as bees, or housewives, or pantomime camels. Fortunately, Flick Colby kept Floyd's number and he occasionally reappears. The next Doctor Who is....? Well, well, well here we are again. It hardly seems any time since we were speculating as to who would take over from David Tennant as the Doctor and pondering how odd (and young) Matt Smith seemed on his first media appearance. This time around, the field is wide open due to several factors some of which may well be hoaxes to keep the story running. There’s the idea that the Doctor will be female (haven’t we heard that before??) or that we will have the first non white Doctor, something which does seem more plausible. Some say Steven Moffat will go with his original instinct and cast older hence the name of Ben Daniels and even John Hurt have been bandied about. Many agree that Ben Whishaw would be perfect; he does after all seem like the result of a temporal collision between Matt Smith and David Tennant.